After only 2 nights in Yellowstone (all I could get at the campground), I headed out the East entrance to Cody, WY. This is a very pretty drive. "Buffalo Bill" Cody was instrumental in founding the town. It's now the home of the Buffalo Bill Historical Center, actually 5 museums under one roof. Annie Oakley performed in Buffalo Bill's Wild West show, a circus-like attraction that toured for many years. Outside is his childhood home, moved here from Iowa. Another museum is the Whitney Gallery of Western Art. Their showpiece was this 1892 painting by Thomas Moran of Yellowstone Falls which I had just seen. The painting was on loan from the Smithsonian. The Plains Indians Museum was another of the five museums. The other 2 were the Cody Firearms Museum (yawn - guess you have to be a guy) and the Draper Museum of Natural History. The $15 entrance fee was good for 2 days, which was good. There was a lot to see. Cody is a really colorful, cowboy town. I really liked it! This was a cute little RV. The main thing everyone wants to see at Yellowstone is Old Faithful. It erupts about every 90 minutes these days, and you can cut the suspense with a knife. After a few spurts of false starts, thar she blows! Built in 1903, the Old Faithful Inn is close to the geyser, and appears to have a paid buffalo guard. This guy never moved, but I'm pretty sure he was alive. The lobby of the hotel features a 65-foot ceiling with railings and supports made of contorted lodgepole pine. While I was on the balcony of the inn, Beehive Geyser erupted! This one erupts only every 2 days or so! This hot pool was one of many nearby. I didn't get the name, but I liked the colors. Another highlight of Yellowstone is Yellowstone Falls, in what is called "The Grand Canyon of the Yellowstone." This is the view you get from Artist Point. There are actually 2 falls, and this is the more-often-seen Lower Falls, which drop 308 feet. You can even walk down to the brink of the falls if you want. Grand Prismatic Spring is the largest of Yellowstone's many colorful hot springs. It's 200 feet across, and the colors are brilliant. Inviting as it is, however, don't jump in! The temperature is a scalding 160 degrees F (70 degrees C)! The only place you can safely swim in Yellowstone is way downstream near Firehole Falls on the Firehole River. It was a hot day, so the old swimming hole was very popular. The last thing I went to was the terraces at Mammoth Hot Springs. Very surreal. I saw lots of stuff at Yellowstone, and this only touches the surface. There are many beautiful scenes in Grand Teton, like this classic of Mt. Moran reflected in Oxbow Bend. But I digress... I was out to find wildlife! Here's another "brown blob," this one is a wolf. And here's another great scene. But wait! What's that in the very center! Here you can just make out the elk's teeth. The bear kept having to stop and chase off the ravens who were not-so-patiently waiting their turn. Nearby was another old cabin, this one actually had a roof! Still a fixer-upper, though. And it also had a great picture window. But here's the best part -- Up the hill and across the road from the cabin was a free, beautiful, legal campsite!!! Wow! Too bad I didn't find this earlier. I'm on my way to Yellowstone now, stopping for another wildlife shot, this time an elk. He was a great poser. And guess what! Another buffalo jam! This one was great. These two males were really going at it. It must be getting close to mating season. One day at Grand Teton I took the shuttle boat across Jenny Lake to hike to Cascade Canyon. You can also walk around the lake, but that adds several miles to the journey. About a half mile from the boat landing is Hidden Falls. Kind of hard to get a pictures, but the falls were nice. Once you climb that much, you might as well go farther up Cascade Canyon, which is relatively flat. This mule train was taking supplies and food to a group working on the trail farther along. There's plenty of beautiful scenery in the canyon. Thirteen years ago I was walking on this trail and 2 moose were walking right towards me. No such luck this time. I walked as far as this little lake, then turned around. Back on the main park road I saw this reproduction of an old ferry that crossed the Snake River. Near the ferry was a reproduction of an old store, with a woman dressed in authentic old clothing, talking on an antique cell phone. Inside there was a unique chair made of moose and elk antlers. And on the way home was the usual buffalo jam. It was a great day! What I remember most from when I was here as a kid is these elk antler arches. There are 4 of them, at the corners of the town square. They have been here since 1960. About 7500 elk winter in the area, and each spring the bulls shed their antlers. Boy Scouts collect them and sell them at auction in the square each May. Right on the square, the Million Dollar Cowboy Bar is a great place to go dancing. The bar seats are saddles! The place was filled with cowboys -- I loved it. 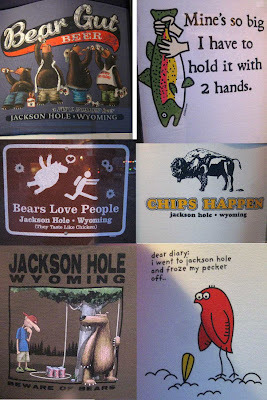 Jackson Hole has quite a collection of cute t-shirts. You might have to click on the picture to enlarge it in order to see some of the fine print. But this is my favorite. Ever wonder what "Grand Tetons" means? Well, now you can figure it out. Last weekend we went to the Jackson Hole Scottish Festival at the Teton County Fairgrounds. LOTS of guys (and gals) in kilts, playing bagpipes and different drums. Personally, I was hoping for a stiff breeze. I always wondered what was underneath the kilts. The seven bagpipe bands each competed twice. Afterwards, the Wolves of Dunvegan did some impressive fighting with real weapons. This guy was downright scary. Throughout the day, there were different Scottish athletic competitions. Here, gigantic guys in kilts throw (telephone?) poles end over end. 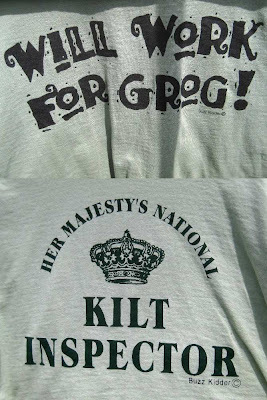 And those Scots had some interesting t-shirts too. Wow, Is This Place Pretty!